All Day I Dream About Crafting | Follow along my adventures of learning how to craft! Follow along my adventures of learning how to craft! I’ll be on soon to post and share what I have been working on. It has been awhile but I’m hoping to find a way to get on a schedule with posting on a more consistent basis. I’m really excited about this new hobby (new to me, not to others) I’ve been investing my money time into. Also football season is knocking at the door so I will have plenty to say about that too! Talk to you soon and have a blessed day! Welcome to my new blog! This is my first attempt at doing anything like this. Usually I'm on Pinterest or ranting on Twitter. So now I'm excited to start something different and new and to share it with anyone! 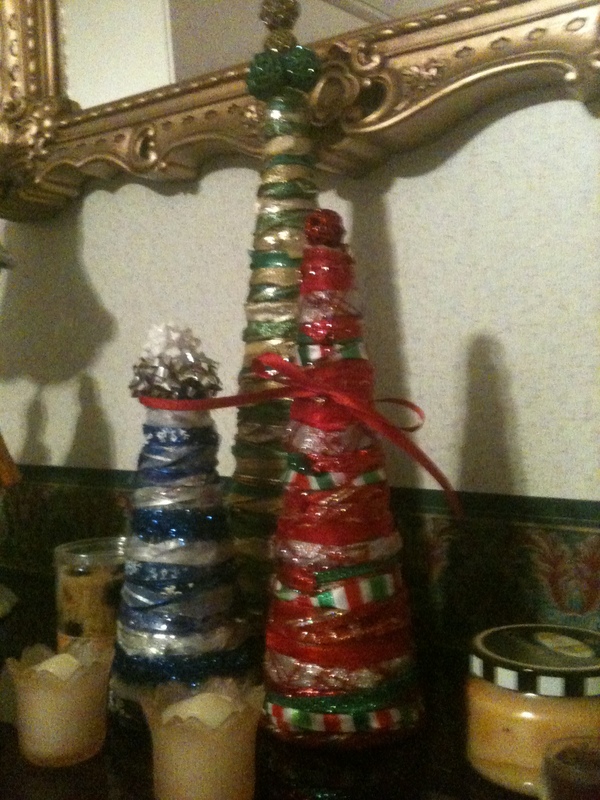 This past Christmas I had alot of weekend time to get busy with decorating! Believe me, this was a huge treat for me! For the past 10 yrs I've worked a job that didn't allow me much free time during the holidays. But this past January, I was blessed to find an awesome job that suits my football schedule perfectly! So I got the tree up, (actually it stayed up all year) and started attempting some decorating around the house. I just recently got hooked onto Pinterest (I mean seriously why did I not join that site sooner???) and started developing some ideas of what I wanted to do. The hard part was not to over burden myself, which I did. Instead of taking on one project at a time, I was working on 3 or 4 at a time. My workspace was (and still is) a nightmare! The first thing I wanted to try was an outside pinecone garland. I love pinecones and set them out on fall and Christmas plates each year. 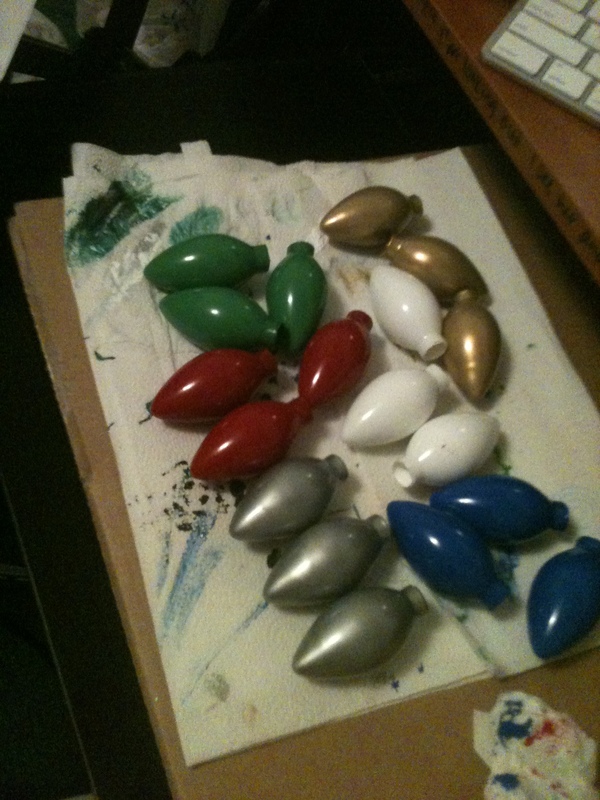 Last year I painted some with gold glitter. This year I wanted to hang them around the deck with lights. So I started in September painting pinecones with acrylic paints, one at a time, BY HAND! Let me remind you I’m just getting into crafting again for the first time in years so bear with the silly mistakes I made. One day my dad asks if I’m ever going to finish painting those pinecones (there were over 150) and I reassured him I would be done by Thanksgiving. He looks at one and says “is that paint weather-proof?” “Yeah, sure Dad! No problem!” I hurried up and ran one under some running water and to my disappointment, the paint started to peel. 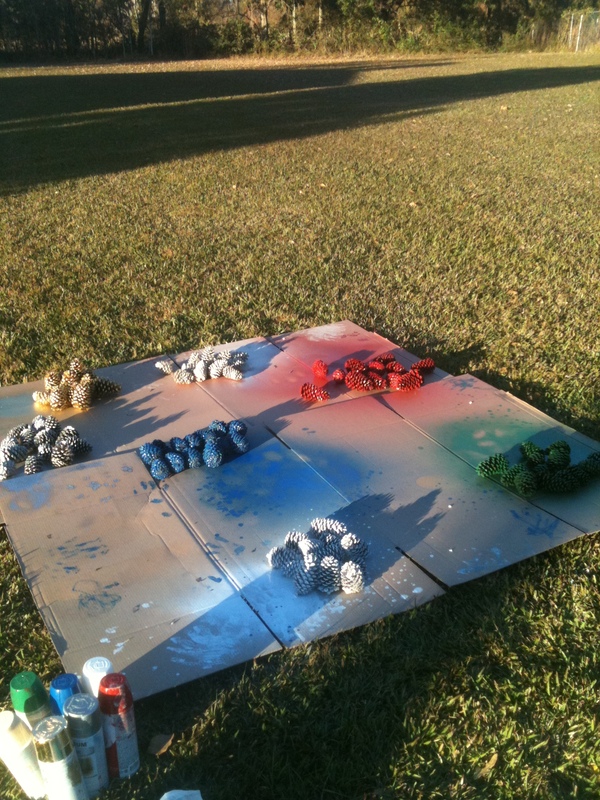 So without telling my dad he was right, I went purchase some spray paint, brought the pinecones outside and gave them all a good coating. Yep in ONE day they were all done. The garland still wasn’t done by Thanksgiving. In fact I didn’t finish it until after Christmas. As soon as I remember to get a picture of it, I’ll post. Oh and just FYI all of the photos here were taken with my Iphone. The flashless one so you won’t be able to see details too well. Yeah I need a new camera. 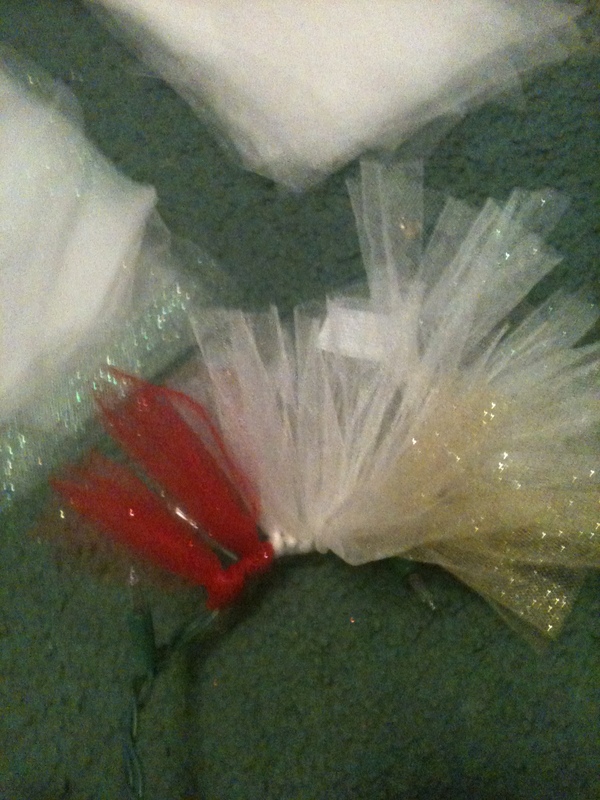 It took awhile to loop all of the tulle around the lights but it was so gorgeous once it was finsihed. All the lighting and sparkles everywhere! Just what a girl loves! 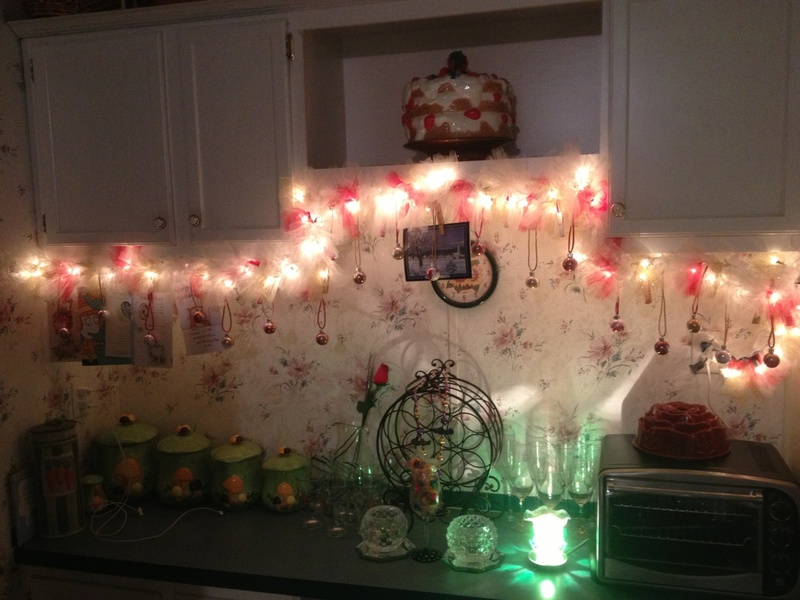 I measured my cabinets where I was hanging the lights so that I knew where to place the clothespins and ornaments. This was also the same time I started realizing how much I loved my glue gun. 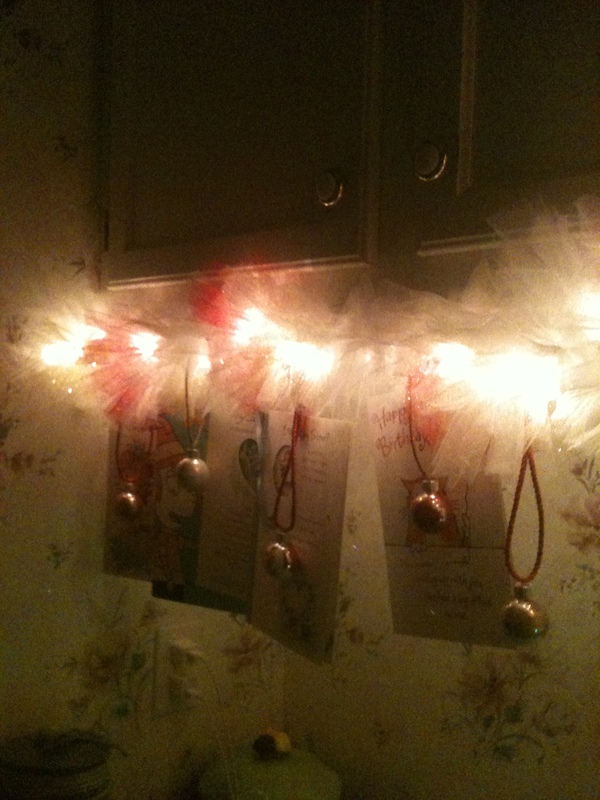 I wanted the clothespins to hang from the lights but not too low. So I glued 3 inch pieces of ribbon to the clothespins, wrapped it around the lights where I wanted them, and glued the ribbon back to the clothespin. The ornaments were hung on the lights with ribbon. I used thumb tacks and wood tape to hang it. Unfortunately the string of lights was a little too long so there are some hanging in the back. This was the best detail I could get with my camera. 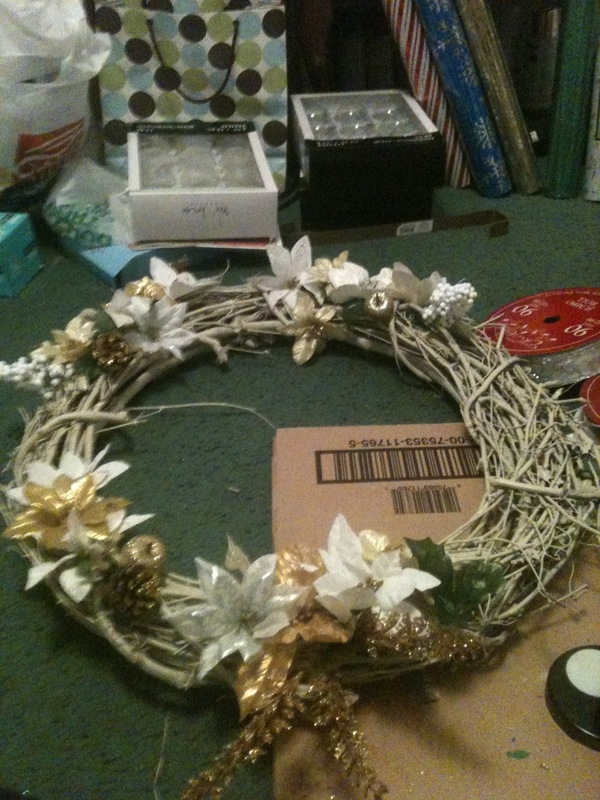 So now that the glue gun addiction was taking over I started making wreaths. 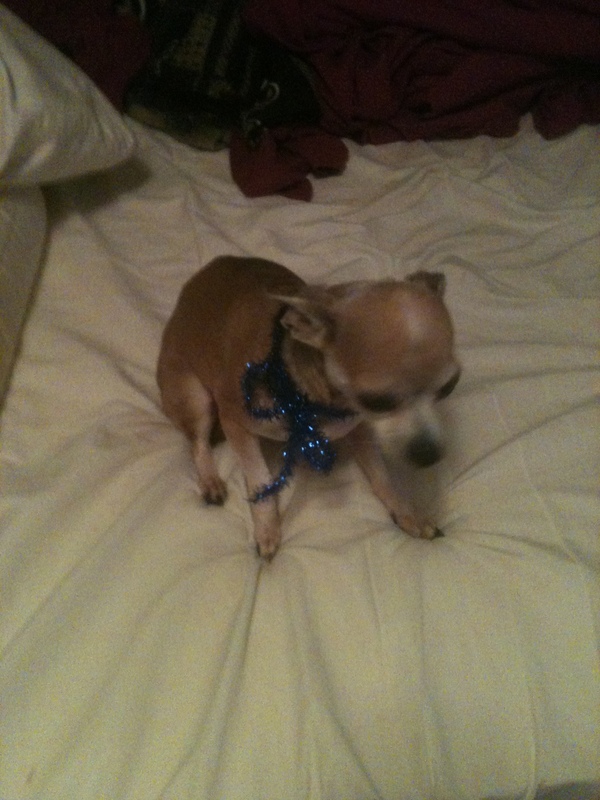 I went to the Dollar Tree and Hobby Lobby and bought some cheap Christmas floral and ribbon. Both wreaths were grapevine (my favorite!) and I just started gluing floral around the first one. 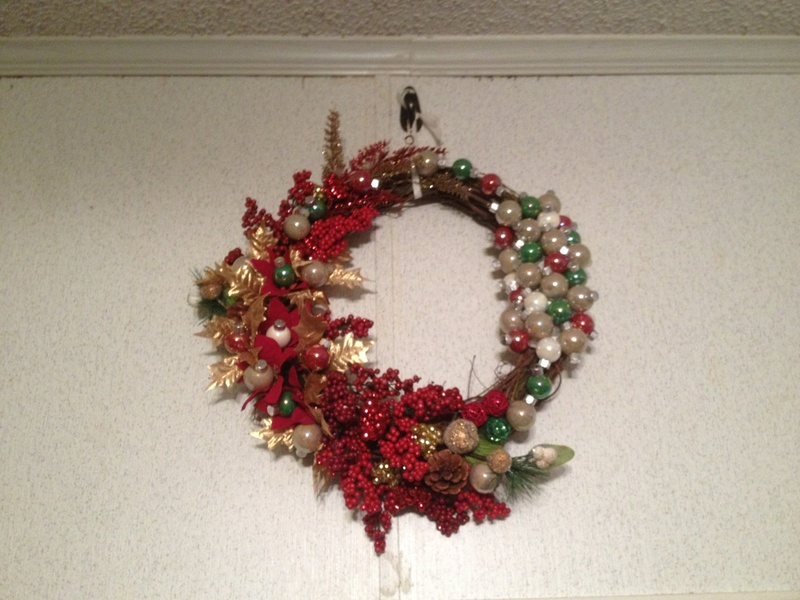 I wanted this wreath to be a winter wreath so most of the items I used were white and gold. 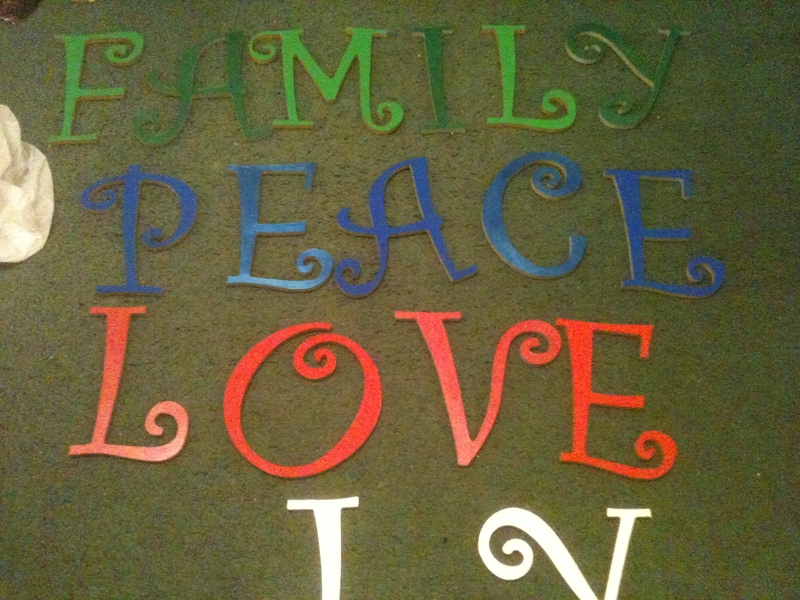 I wanted to put some words up on my walls, so back to Hobby Lobby I went and bought some wood letters to spell the words family, love, peace, and joy. I also picked up some Christmas craft sale items to glue onto the letters. I painted each word one color but alternated between a solid acrylic and a metallic acrylic. While the letters dried, I took some clear glass light bulb ornaments and put a few drops of paint in, swirled it around, and let those dry. 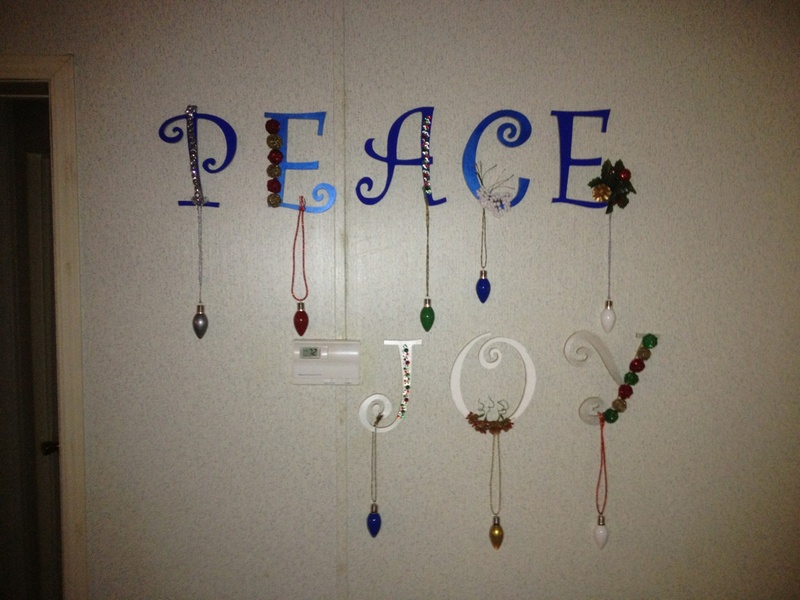 Once everything was dry I glued the craft items to the letters and added the ornaments. I used double sided tape to hang them, which became an issue. They didn’t want to stay on my walls! After getting upset over the few broken bulbs I had, I tried adding more tape and it worked for some but not all. I figured out our wishy washy temperatures were not helping matters and blamed it on the weather 😉 It’s ok I have plans for these babies next year! The green one is my favorite although I’m not too sure about that topper. 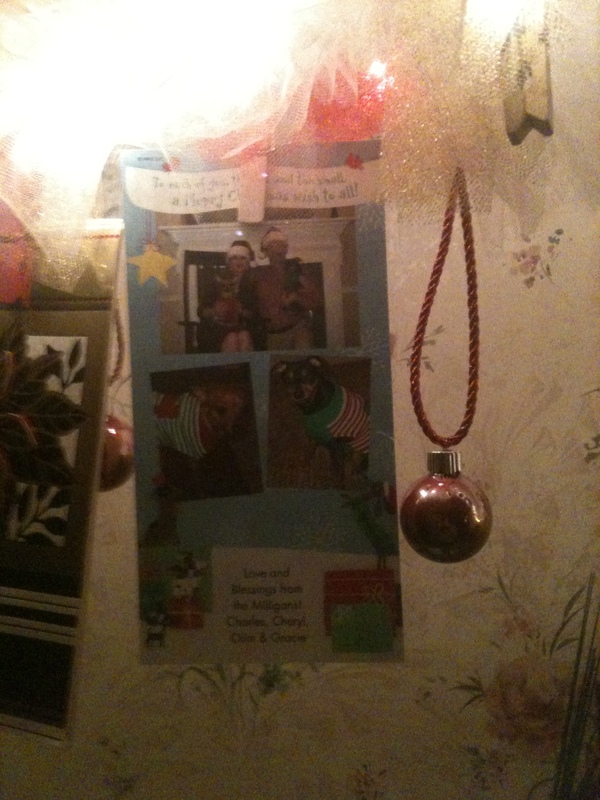 I knew I was going to be spending Christmas Eve and day at my grandpa’s house so I wanted to make something for him. 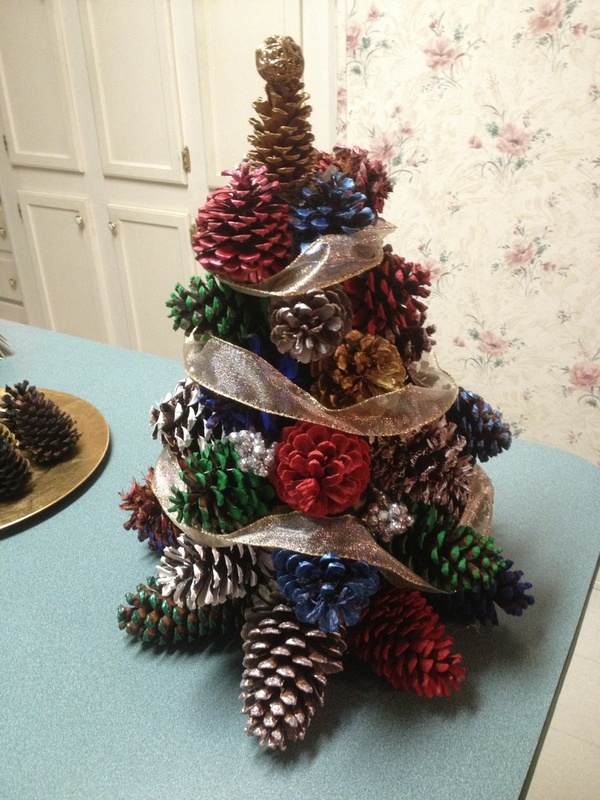 I still had all those hand painted pinecones so I decided to make him a pinecone Christmas tree. I didn’t think I had enough pinecones to do it but had to try. 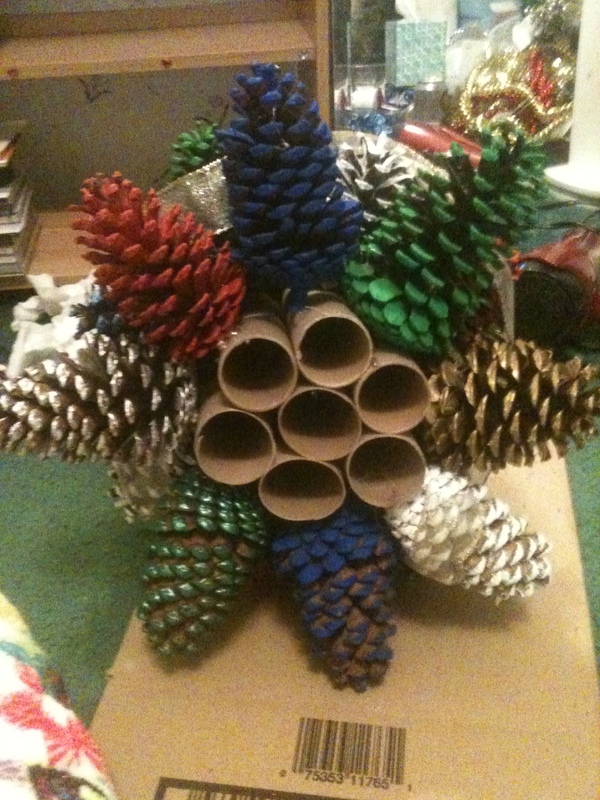 I busted out my bestie, the hot glue gun, used some toilet paper rolls I had saved for another project and started gluing the pinecones on by size. I added some ribbon to try to cover some of the holes where you could still see the toilet paper rolls. Finally I was done making decorations. I still had some time so I decorated the babies! Maru seemed to like it! 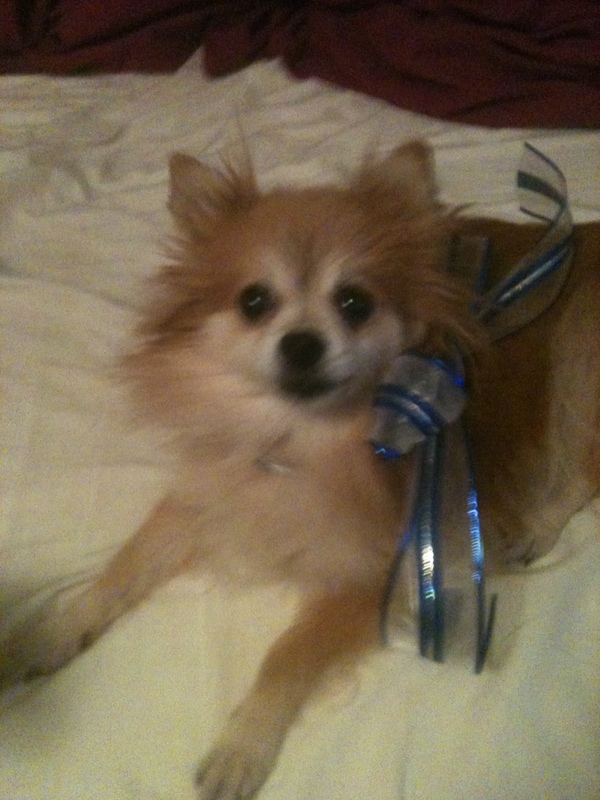 She wore it aaallll day! Next year I hope I will spare more time for decorations. Your house can never look too Christmas-y!